The Muziekgebouw aan 't IJ, which is the location of the Huygens-Fokker Foundation, is situated at 10 minutes walking distance from Central Station, and 5 minutes by car from ring road A10 east. It is 3 minutes by tram from Central Station. 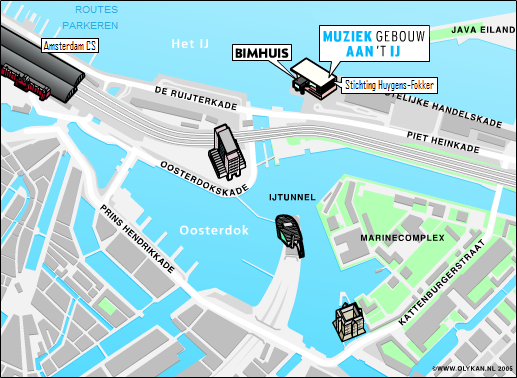 There is a parking garage (Parking Garage Passenger Terminal Amsterdam) next to/under the Muziekgebouw aan 't IJ. From there a lift brings you directly to the main entrance hall of the building. 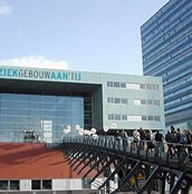 Our office is situated at the fifth floor of the Muziekgebouw, at the eastside of the building. When you walk through the walkingbridge and revolving door, you arrive directly at the entrance on the second floor of the Muziekgebouw. At your right hand two elevators go up to the offices. When you arrive at the fifth floor you will find a bell and our name on a plate, next to the glass door. It is also possible to walk from the Central Station. Walk through the station in the direction of the IJ (exit North). Turn right outside, and follow the waterfront until the bridge. Go up the bridge and when you get to the middle you will see on your left the footbridge to the Muziekgebouw aan ’t IJ / Bimhuis. From Central Station, cycle over the long bridge in the direction of the Piet Heinkade. At the end of the bridge, turn left by the PTA and cycle past the PTA to the Muziekgebouw aan ’t IJ. There is a covered cycle rack directly under the Muziekgebouw aan ’t IJ. From the East ring road A10, take exit S114 in the direction of the centre (Centrum). You enter the Piet Hein tunnel. At the end of the tunnel, turn right in the direction of Central Station. After the third set of traffic lights, take the second exit to the right. The entrance to the parking garage is in front of the PTA. If you are coming from Haarlem, follow the S103. There is a 24/7 parking garage directly under the Muziekgebouw aan 't IJ (entrance in front of Passenger Terminal Amsterdam) with 550 parking spaces (rate € 3,50 per hour, € 35,00 per day). You can also park your car just outside the city and then use public transport; for instance at Transferium ArenA, P+R Olympisch Stadion, P+R Amsterdam Sloterdijk or P+R Zeeburg. Here you can park and receive a tramticket for only € 6,- during 24 hours. Huygens-Fokker Foundation is registered by the Chamber of Commerce in Amsterdam under number 41223177. Our account number of the ABN/AMRO bank is 56.12.27.780 (BIC: ABNANL2A), and the account number of the ING bank 2405012 (BIC: PSTBNL 21 /IBAN NL72PSTB0002405012).